Before you read this, let me just say, I know that I’m a dork. I admit it, acknowledge it, accept it, and even embrace it. Let’s move on. I know that you might be thinking: it looks kind of cheap. I agree. But don’t let appearances deceive you. This might be the perfect pen. 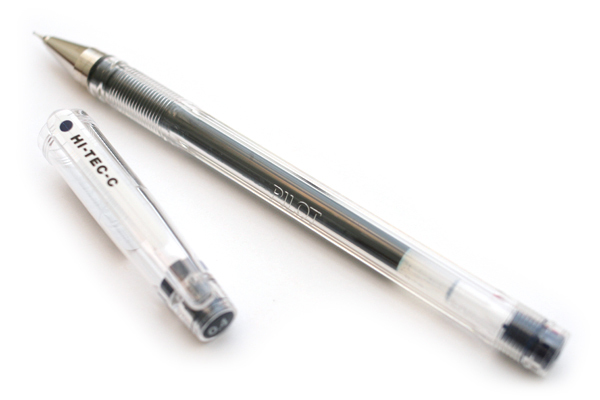 This pen comes in many size tips, from .18mm up to .7mm. The sweet spot for me is the .4mm. I can’t say it enough: I love this pen. I bought one on December 1, 2009, and have been using it since. It’s almost out of ink, I expect it to run out any day now. I will actually be sad when this pen is dead. I will miss this pen. Yes, there are millions more available down the street in the stationary store, but let me say it again: I love this pen. The point is small, so you can write small. The metal point gives just enough bite to the paper (I use a Moleskine notebook), and the ink flow is smooth and generous, yet never splotchy. The ink dries very quickly, so it never smears. This is as close to the perfect writing experience as I have ever had. And they’re cheap: for less than US$3, I bought a disposable pen that has lasted for six months. Now that I’m looking down the gun barrel of my return to the US, I’ve started to look for places where I can find this pen in America. I have never seen this pen in the US. I might have to arrange for someone in Taiwan to send me a box of these every six months or so. Otherwise, I may go through withdrawal. Yes, I know, and yes, I agree that it bears repeating, so let me say it for you: I’m a dork. I don’t care, though. I’ve been in writing heaven over here, and I don’t care what you think. This entry was posted on Thursday, May 27th, 2010 at 11:19 pm and is filed under Taiwan. You can follow any responses to this entry through the RSS 2.0 feed. You can leave a response, or trackback from your own site. Honest to God, I just had our student order you 10 V-Ball pens yesterday, knowing you’d need them when you come back. Now I fear this small pen offering will be inadequate in the face of the perfection that is the HI-TEC-C. If one lasts six months, can’t you bring twenty of them home with you and have a ten year supply? UPDATE: I found a place that sells the pens via mail order and ships to the States! Oh, happy me!